In Atlantic City, N.J., a group of local bigwigs is celebrating a federal economic stimulus. The year is 1920; the coming boon is Prohibition, which will make those able to effect the illegal sale of alcohol  like the elected officials at this banquet  very rich. As musicians in blackface lead a mock funeral procession for John Barleycorn outside, Enoch "Nucky" Thompson, treasurer of Atlantic City, toasts the reformers who are about to raise the price of liquor twentyfold: "To those beautiful, ignorant bastards!" Prohibition did change the country, but not as intended. Drinkers paid more for worse booze. Fishermen became rum runners. Politicians became gangsters. Gangsters became legends. And with that, they created a new American myth: the gangster tale. Boardwalk Empire (HBO, Sundays, 9 p.m. E.T. ), the best new drama of the year, is the sweeping birth story of that myth, centering on Thompson (Steve Buscemi), the man who kept Atlantic City wet. It's also HBO's return to the field of big-budget, big-idea dramas it dominated in the Sopranos era  sprawling and violent, with a dark but clear-eyed view of history. Empire, based on a history of Atlantic City by Nelson Johnson, has plenty of Mob-story DNA. It was created by Terence Winter, once a writer for The Sopranos, and executive-produced by Martin Scorsese, who directed the lavish pilot. There's more to Empire than pinstripes and tommy guns, however. Nucky  based on Nucky Johnson, Atlantic City's real-life treasurer-boss  is something less, and more, than a gangster. He's a public servant who lives on an entire floor of the Ritz-Carlton. Almost every dollar spent in Atlantic City makes a detour through his pocket. But he's a benevolent despot, suave and charismatic, dispensing the patronage that makes the city work. And as unofficial boss of the city, Nucky is, in his way, an entertainment mogul. In the days before TV and commercial radio, the boardwalk was a visual spectacle that turned everything into entertainment, including a baby-incubator storefront where gawkers could pay a quarter to see "what science has done for nature's weaklings." (HBO built a block-long boardwalk along the East River in Brooklyn, and the set gives Empire an air of brassy grandeur.) It's a seaside monument to the American id and a populist ideal: rich or poor, every man is a king here, as long as his money spends. 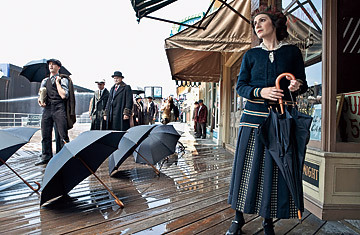 As Empire begins, Nucky meets with gang leaders to cement his town's role as a hub for the booze trade. Representing New York: the man who fixed the 1919 World Series, Arnold Rothstein (A Serious Man's Michael Stuhlbarg), and his hotheaded lieutenant, Charles "Lucky" Luciano (Vincent Piazza). Chicago boss James "Big Jim" Colosimo (Frank Crudele) is skeptical about the new business, but his young and hungry driver, Al Capone (Stephen Graham), sees a chance to make his move. This generational conflict plays out on Nucky's end with his protégé, Jimmy Darmody (Michael Pitt), a Princeton student who left his F. Scott Fitzgerald bubble to fight in the Great War and now sees the world as a brutal place. He urges Nucky to move boldly: "You can't be half a gangster," he warns. "Not anymore." But Nucky is half a lot of things, and pulling him in yet another direction is Margaret Schroeder (Kelly Macdonald), a young mother he meets through, of all things, the women's temperance league. A freethinking Irish immigrant whose drunken husband beats her, Schroeder is a reminder that Prohibition wasn't just about prudery; it was part of a decades-long progressive reform movement that was about to give women the vote. Prohibition's puritan side is represented by federal agent Nelson Van Alden (Michael Shannon). Dour, repressed and (literally) self-flagellating, Van Alden is like Eliot Ness reborn as a Spanish inquisitor; just before essentially torturing a man for information, he scolds a colleague for taking the Lord's name in vain. Empire's parallels to today's issues  personal liberty vs. social protections, reform vs. overreach, opportunity vs. predatory capitalism  are clear. There are grumblings against the nanny state and ugly strains of nativism. (The Ku Klux Klan recruits openly in the streets.) On top of these big ideas, Empire is well cast to the point of showing off. Buscemi, usually a quirky supporting player, is a revelation as a lead, by turns droll, disarming and terrifying. Stuhlbarg plays Rothstein with chilling reserve, while Macdonald finds layers in Margaret, who's far tougher and savvier than the naïf she at first seems. Boardwalk Empire is not the reinvention of a genre that The Sopranos was; in a way, it's more like HBO's western Deadwood, a gritty, fully formed history. Like a good whiskey, it's rough and smooth in all the right ways. By a few episodes in, you'll want to order it by the case. This article originally appeared in the Sept. 27, 2010, issue of TIME magazine. See the 100 best TV shows of all time. See the top 10 TV dads.